London's blues-rock act Foghat formed in 1971 and has earned eight Gold records, one Platinum record and one Double-Platinum record. The band continues to tour and record, with their new album Under The Influence set for release on June 24th. One of their most popular singles "Slow Ride" was named the 45th "Best Hard Rock" song of all time by VH1 in 2009. Country singer Tyler Farr's album Redneck Crazy debuted at #2 on the Billboard Country Albums chart as well in the Top 5 on Billboard's Top 200 Albums charts. The record also yielded a pair of #1 hits in the title track and "Whisky In My Water." 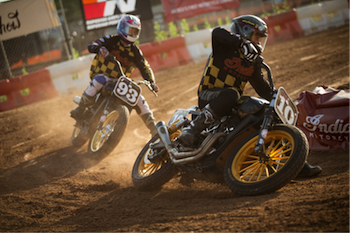 Roland Sands Design's and Indian Motorcycle's recent Hooligan racing efforts are a throwback to '30s era racing, when you raced — and could ride home on — any bike you owned. With its roots in Southern California motorcycle culture, today's flat track Hooligan racing category is rapidly gaining in popularity with riders of all ages and experience levels across the nation by offering the fun of motorcycle competition in a less structured environment, as this class lets racers ride their street-legal motorcycles. 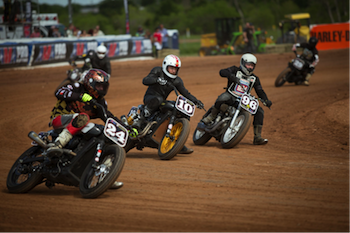 RSD's Super Hooligan flat track motorcycle race presented by Indian Motorcycle will put on a rowdy show of aggressive street bike racing at Lost Highway with an eclectic mix of riders on different bikes, all for the fans! For race sign-up and info visit www.RolandSands.com. "The Lost Highway show is the perfect mix of music, bikes and a big party where I think the people will get more than they expected with the addition of Super Hooligan racing," says Roland Sands. Lost Highway will feature musical performances by headliner Brantley Gilbert, Social Distortion, Eagles Of Death Metal, Justin Moore, Foghat, Chevy Metal, Tyler Farr, Face To Face, Black Rebel Motorcycle Club, Colt Ford, Tony Joe White, Paul Cauthen, and more. 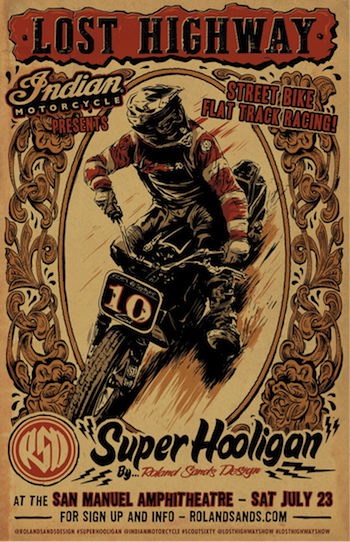 "All for one ticket price, Lost Highway offers fans and attendees a great value with a mash up of bike shows, motorcycle culture, live music, stunt shows, and now the addition of Super Hooligan racing. 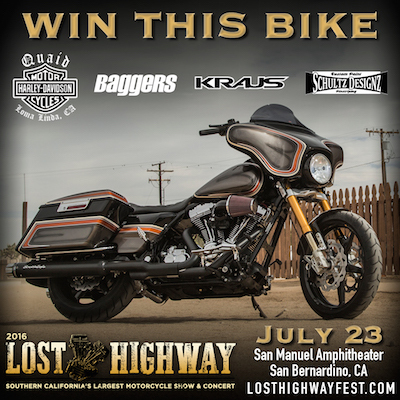 Plus, Quaid Harley-Davidson with Baggers Magazine are giving away a bike customized by Kraus Motor Company painted by Taylor Schultz valued at over $40k for free to someone at the show," says Lost Highway co-producer John Oakes. 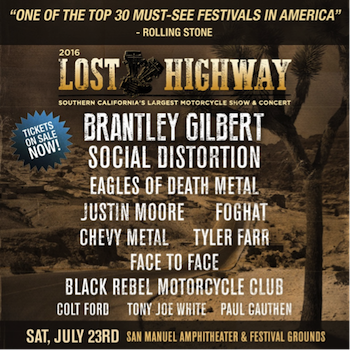 "Lost Highway is definitely the place to be in Southern California on July 23!" Kicking off at 2:00 pm, Lost Highway features a full day of live music, with motorcycle builders and enthusiasts from around the country showcasing their custom bikes to the crowd and to editors of the world's top custom motorcycle magazines—Hot Bike, Baggers and Street Chopper. The magazines will host the motorcycle shows presented by Geico Motorcycle Insurance, with their editors judging the custom creations and awarding trophies and prizes. 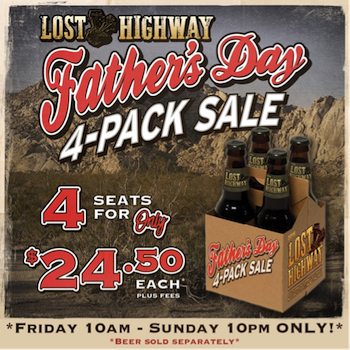 To celebrate the upcoming weekend, Lost Highway is offering a special Father's Day 4-Pack ticketing deal. From 10:00 am PT on Friday, June 17th to 10:00 pm PT on Sunday, June 19th, fans can purchase 4 reserved tickets for only $24.50 each ($98 total), plus fees. Reserved Seats, Festival General Admission tickets, VIP, and weekend camping packages are also on sale now through Ticketmaster. Lost Highway VIP packages include all-day access to the Lost Highway VIP Lounge with dedicated cash bar and private restrooms, seating areas, bag check, and food truck cuisine for purchase. The official Lost Highway kick-off party on Friday night is exclusively for those who purchase weekend Camping. To purchase and see full details on the Father's Day 4-Pack, tickets, VIP, and camping package options, visit www.LostHighwayFest.com. Lost Highway is a motorcycle culture experience featuring top-tier motorcycle professionals including builders, parts and accessories manufacturers, riding gear creators, custom leathersmiths and jewelry designers/makers in the vendor village. UNKNOWN Industries' team of riders will entertain attendees with their freestyle Harley-Davidson riding, with demos throughout the day. Lost Highway will feature the incredible works of some of the most talented motorcycle specialists in the business including Quaid Harley-Davidson—taking over the festival area for the second year in a row—along with Kraus Motor Co., Schultz Designz, Roland Sands Design, Indian Motorcycle, Geico Motorcycle Insurance, Simpson Motorcycle Helmets, Big Al's Cycles, Espinoza's Leather Goods, Speakeasy Original, Speed Merchant, San Diego Customs, Lyndall Brakes, Rusty Butcher, UNKNOWN Industries, Law Tigers, Telegram Sams, Factory 47, Alloy Art, Biltwell, Russ Brown, San Diego Harley-Davidson, Brock's Performance, Broken Homme, Dixxon Flannel, House of Kolor and many more. Lost Highway has also partnered with Quaid Harley-Davidson and Baggers Magazine to give away a customized Electra Glide Ultra Classic valued at over $40,000 built by Kraus Motor Co. and custom painted by Taylor Schultz of Schultz Designz, to be given away on stage. Attendees simply must be present at the Lost Highway Motorcycle Show & Concert to be eligible to win this bike. Baggers Magazine enlisted the expertise of Kraus Motor Co. to take the lead in overall design and customization of the motorcycle including some one-off custom parts, featuring a Kraus Sport Touring inverted frontend. Quaid Harley-Davidson swapped out the stock motor for Harley-Davidson's newly released Screamin' Eagle 120ST Engine, added Brock's Performance BST carbon fiber wheels, Roland Sands Design calipers, grips and more, Galfer USA wave rotors, with various other parts and accessories from Ohlins, Klock Werks, Baker Drivetrain, Dakota Digital, Rizoma, MTX Audio, Kicker, Kraus Motor Company and Harley-Davidson. This ultimate dream bagger is featured on the cover of the July issue of Baggers Magazine with plenty of info about the bike, the partners involved, and everything else in between. Learn more about this asphalt shredding bagger here: http://bit.ly/1WJ2xxI. Lost Highway Motorcycle Show & Concert is made possible through the support of partners Quaid Harley-Davidson, Ram Trucks, O'Reilly, Rockstar Energy Drink, Cosmic Fog, Victorville Motors, Sailor Jerry, Pabst Blue Ribbon, Roadhouse Biker Church, Cosmic Fog, Fxck Cancer, Lagunitas, with more to be announced. Roland Sands Design is a motorcycle, product and apparel company that has its roots in racing, custom bike building and design. Our inspiration comes from a high performance background that blends the love of two wheels with the desire to create unique products. We live the two wheeled life and our crew is a diverse collection of road racers, off-road, dirt track, super moto and custom bike builders and riders. It's this diversity that allows us to work with the best in the industry on a wide variety of projects. Follow all bike builds, new products and the life and times of the Roland Sands Design crew at www.rolandsands.com.